Sorry to be Captain Obvious, but youth sports are expensive. You’ve got to pay for registration fees, equipment, drinks, snacks—and don’t forget there’s always someone who insists on having only organic snacks. And these costs double or triple if you’ve got multiple kids on multiple teams! Worry not! 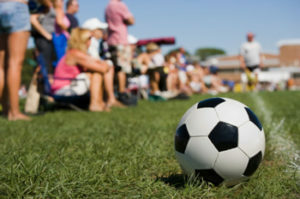 There are plenty of ways to mitigate youth sports expenses. Here are three ways you can save big this season (and hopefully many more after that!). One of the easiest ways to save on team fees is to volunteer your time. For example, some teams waive fees for parents who help out when and where they can. With a career, kids and everything else life throws at us, this might sound tough. However, oftentimes teams only look for a few hours of volunteer help every season. Don’t forget to check other places you can save as well. For instance, many leagues will offer price breaks for early bird registration. Buying used can be huge for young athletes who don’t mind previously loved equipment. You’ll be surprised at the condition much of the gear is in. Young athletes often outgrow their old equipment before they’re able to use it for more than a season or two. This often leaves used goods almost like new! Of course, with things like helmets (especially for football), you might want something relatively new. While there are often great deals for used sporting equipment, make sure to hand inspect any safety equipment you buy. Also, make sure your young athlete tries it on first. Also, take care of your old equipment and it will take care of you! Instead of buying new when a piece of equipment seems worn out, see if you can fix it up. Getting a little extra life out of a pair of cleats can make a world of difference. If you must buy new equipment (some teams require this), consider partnering with other parents and buying in bulk. You’ll be pleased at the deep discounts you can receive by purchasing twenty new helmets instead of just one. This is also true for snacks and drinks. Take a trip out to your local bulk retailer and grab cases of low-cost snacks and beverages instead of going to the grocery store. Alternatively, some dry goods can be purchased in bulk online for pennies on the dollar. Yes, youth sports can get expensive. But they don’t have to be! Try these simple ways to save.